Just a short couple of thoughts to start the week concerning the budget proposal of President Trump. President Dwight D. Eisenhower said: “Dollars and guns are no substitutes for brains and will power,” and this budget is long on dollars and guns but well short of brains and power. I’m not going to spend long on this today as the budget proposal itself is probably dead in the water having invoked the ire of both Democrats and Republicans on Capitol Hill. But apart from that the budget proposal shows the moral bankruptcy of this administration. The fact that when confronted by Tucker Carlson on Fox News about the effects that killing the Affordable Care Act would have on his supporters across the country, the President basically shrugged his gave a “so what” kind of answer. 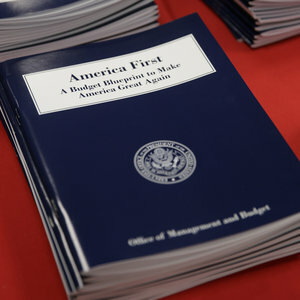 Likewise, his budget proposal, which actually raises Federal spending takes the axe to America’s diplomacy and soft power, its concern for public health and disease prevention, its neglect of crumbling infrastructure, its concern for the preservation and advancement of education and culture, and its outright condemnation of the poor and the elderly in order to fund a military buildup without enunciating a clear national strategy in order to justify it. When I read through the proposals in the budget I was convinced of its fundamental immorality and I thought of Eisenhower’s oft quoted remarks in his Chance for Peace Speech of 1953. Obviously the costs have to be adjusted for inflation, but the truth is that an arms buildup in absence of a clearly defined threat, is nothing more than an immoral policy that promises only war and death poverty and ignorance, disease and suffering. I am going to go back to that speech later this week because it is important to place all of this in its moral and political context. Someone needs to explain to me why we need all of these expensive weapons–advanced fighter jets, bombers, ships, etc. The last three wars the United States has been involved in have been with technologically unsophisticated enemies. Yet we’re still arming as if we expect conflict with another First World power. Why wouldn’t it make sense to modernize our military and retool it to better handle the smaller insurgencies and brush fire wars we’ve been fighting since the 1960s? Trump and the Republicans have no grasp on this concept. Obviously a bad analogy on your part. Nothing to do with that. You show that you don’t know the philosophy of Hobbes that places the acquisition of wealth above all as the highest virtue. That is the foundation of modern capitalism, not Adam Smith. It is also the poison that destroys all modern republics.